As always, I would say for a pure gebirgsjäger experience! 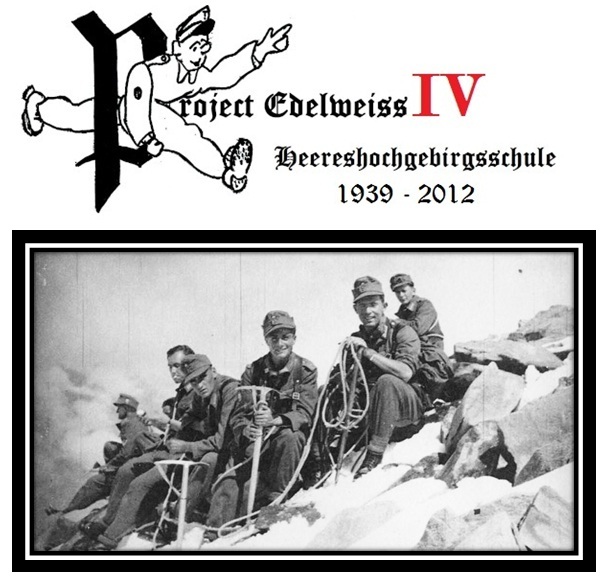 Project Edelweiss has for objective to live mountain trips in period conditions, it is a sportive and an reenactment event. PE2012 will happen for the first time in the Swiss Alps. The accurate place is communicated to the participants when the chosen path is confirmed (January 2012). The final date will be decided in January 2012. The deadline for the inscription is on 1st February 2012. - Excellent physical conditions - it is first a mountain trip, then a reenactment event, do not forget it! - Quality of the uniforms and equipments – pre-war Gebirgsjäger impression only. The coordination of the event is on the right track, the dates are fixed 31 May/1-2 June 2012 (the 30th and the 3rd will be the arrivals/departures days). By now there are almost 17 participants from Germany, Poland, Spain, USA, UK, Italy, Netherlands, Switzerland, France & Ukraine. The registrations close on February 1st. I stay available if you have questions. The inscriptions are closed, the number of candidates is already now exceeded. So looking forward to see the photo's already!! Although I had no real chance of attending, I wish all who will be going a great journey! Be sure to take lots of pictures (both moving and still) and don't forget to post them on the board. You have all set a high standard on your previous adventures so, I expect the same this time around! Thank you very much for your comments, I think also Franz I'm doing the right thing but such a way of reenactment (the true and only one for me ) is sometimes difficult to make understand by the volunteers. It is not only about uniform and impression but performance and physical conditions. There is a huge difference between to pretend to represent the Gebirgsjägers and really doing what they done in the same (almost) conditions. As I wrote the 2012 edition is the last classic edition, another opportunity to share mountain experience and introduce new people to this vintage mountain world. The future trips will deal with more serious challenges... it is time to make my dream, which some of us share also, come true ! Last edited by glenn on Thu May 24, 2012 11:42 am, edited 1 time in total. Here is the final list of Participants for PE2012. Coordination on track, only one uncertainty to face: weather ! See you upthere Bergkameraden !!! Best of luck kameraden! I aspire to one day be able to make the trip, but until then I wish you a great time, safety, and all the best! Look forward to the photos! Back from Project Edelweiss 2012 with plenty of memories and photos !